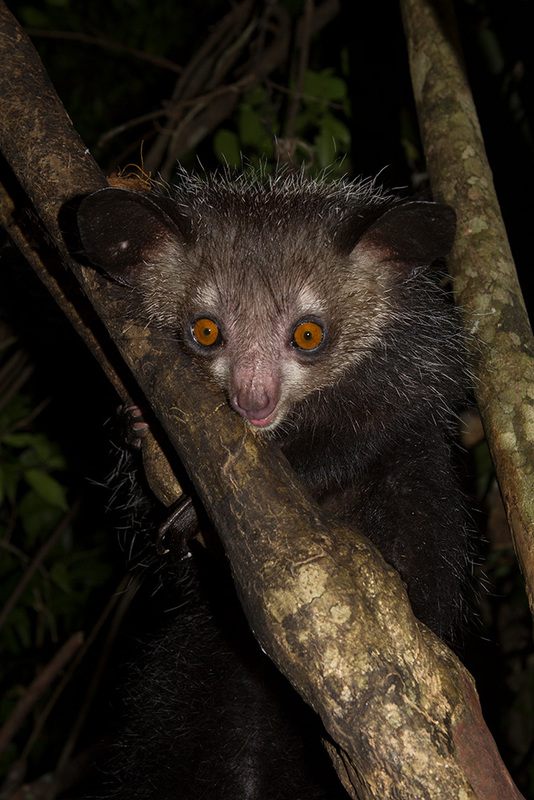 No other animal in Madagascar has as many myths and fairy tales as the Aye-Aye (Daubentonia madagascariensis). 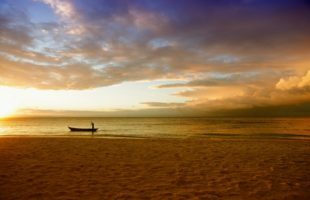 Throughout the northern half of Madagascar it is fady, which means taboo. Unfortunately, this fady does not mean that the animals are not touched by Madagascans, as with chameleons, for example. 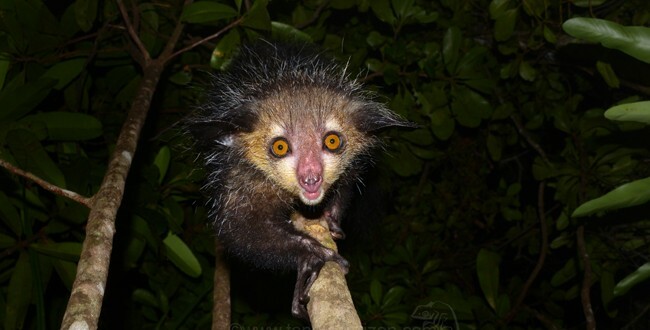 Instead, many inhabitants of Madagascar believe that the encounter with an aye-aye brings misfortune or even death. If a finger animal is seen in a village or in the field (the animals have a preference for corn, sugar cane, coconuts and mangos), many people try to catch and kill the animal. This is the only way to avoid the subsequent disaster. 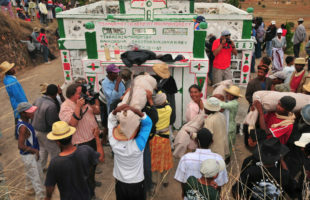 The saying “Mangatambo hita, miseo tsy tsara” (= To see the animal is no good) is common to many locals. However, there are major differences between villages, tribes and regions as to when exactly something happens. In the northernmost area of Madagascar, many Madagascans believe that an Aye-Aye entering the village brings misfortune to the entire village community. To escape this, people have to leave their homes. This seems to be an older faith to which not too many adhere today. In the 1960s, however, such abandoned villages were documented. 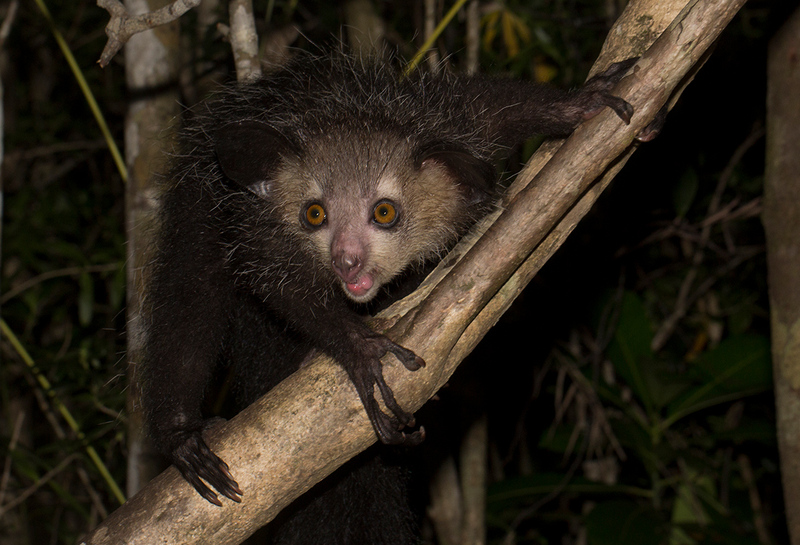 Some Madagascans in the north still believe that Aye-Ayes are man-eaters, which is why you should never leave your village in the dark. Northwest of Amber Mountain National Park there are several villages where the appearance of Aye-Ayes was associated with the death of a villager. It was then assumed that an older Aye-Aye in the village predicted the death of an older villager, a younger Aye-Aye that of a child. In coastal areas of the far north and along almost the entire east coast (Sambava, Antalaha, Maroantsetra, Mananara) it is believed that an encounter with an Aye-Aye in the forest has no consequences, since the animal is there in its natural environment, its home. 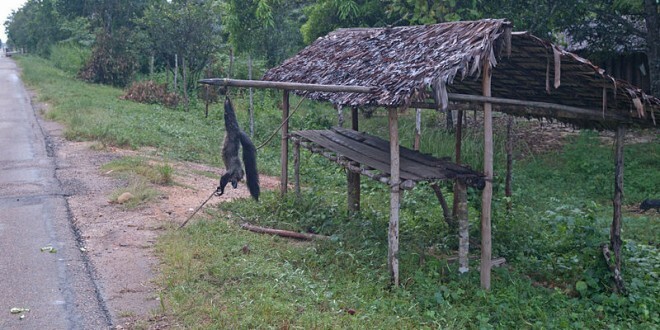 But when it leaves the forest and sits on the roof of a house, it is considered a bad omen for the family concerned. Something bad will happen within the next week. Near Andasibe, a little further south on the east coast, a local myth says that you already die or get sick when an Aye-Aye looks at someone or points at a person with the extended middle finger. 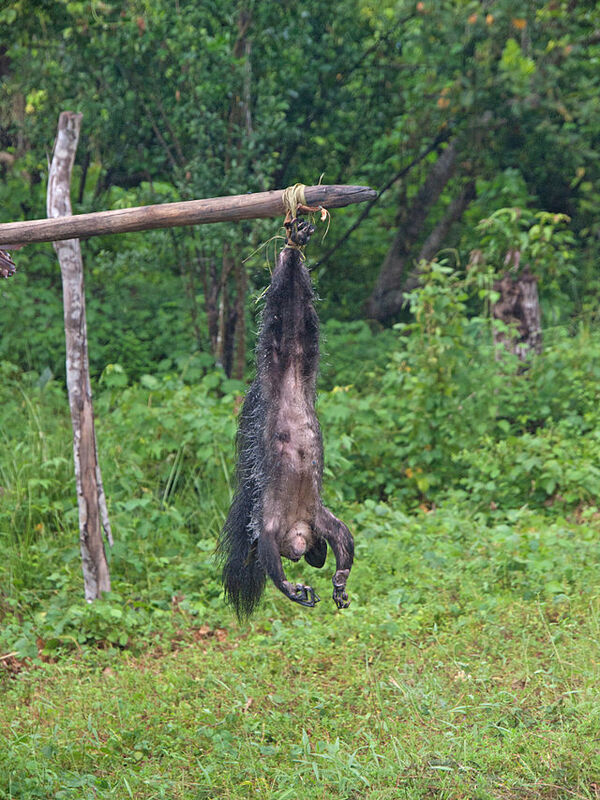 Almost everywhere, the bad fate can only be stopped by killing the Aye-Aye. 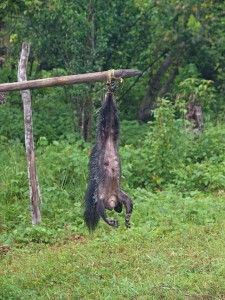 The dead animals or their tails are then hung upside down on sticks at the roadside. There are also different opinions on the reasons for this custom: Some say that passing strangers take the animal’s misfortune with them and thus transport it far away from the place of sight. Others claim that the bad fortune must only be brought together with the animal outside the village borders in order to no longer have any influence on the inhabitants. In the northwest of Madagascar and near Toamasina (Tamatave) there are isolated villages that even consume Aye-Ayes on festive occasions. However, this is only possible if the misfortune has previously been banished by means of magical customs, for example the singing of certain songs or the simultaneous weeping of all the village children. If this “expulsion of evil” is not successful, the consumption of the animal poisons those who celebrate. Each area has its own little legends and myths about the Aye-Aye, unfortunately only a few of them are positive. It is interesting to note that when Aye-Ayes were first discovered in Ranomafana National Park, south of the capital, the native Madagascans did not even know the animal. Accordingly, there were no fadys yet. In areas where the Aye-Aye is seen more frequently, the fear of the animal generally seems to be less abundant. No other lemur in Madagascar has such a bad reputation. This is not so hard to understand, because the nocturnal forest troll with its glowing, yellow eyes, protruding teeth, extremely long middle finger and grey, brittle coat can definitely make you shiver, especially at night. 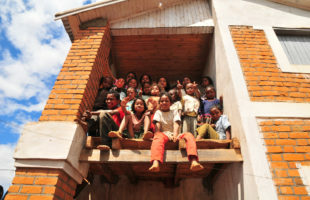 Even more in a country like Madagascar, where many people have little or no access to education. 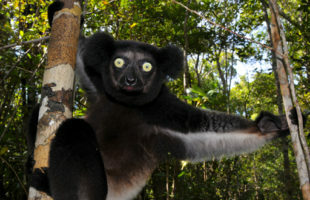 In addition, unlike all other lemurs, Aye-Ayes are purely nocturnal and live alone. They therefore differ from the image of the friendly family animal that is attached to many other lemurs. To make matters worse, many Madagascans know the animal only from legends, because most Madagascans still live very simply and direct their activity to the sun. But those who go to bed with the sunset will only meet an Aye-Aye in exceptional cases. And when he does, it is more than frightening for him if the curious animal also comes close to him and does not run away. In some areas of Madagascar, the nuts preferred by the Aye-Ayes, Ramys, are often found near graves, where the trees must not be felled because of a fady. It is quite possible that in these regions the connection between the Aye-Aye and death was drawn. The color black is also associated with bad or evil almost all over the world, which certainly does not make a black lemur with strange body proportions more likeable among locals. 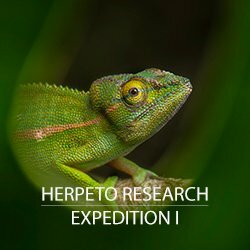 It is to be hoped that with increasing education and ecotourism in Madagascar, the locals will also realize what a unique treasure they have on their island. Maybe at some point the Aye-Aye will be protected instead of hunted and killed. We hope it’s not too late until then.